Lydia of The Perfect Pantry needs no introduction. A professional food writer, author, cooking instructor, and food blogger extraordinaire, Lydia’s “The Perfect Pantry” is packed with very useful food-related articles, resources, and drool-worthy recipes. Lydia has been a supporter of Rasa Malaysia since the very early days. Her comments are always warm, insightful, but most of all, she has a genuine appreciation for Malaysian cuisine. So, you could imagine how delightful and excited I was when Lydia agreed to pen a guest post for this humble blog, and that she would share her story about mee goreng. Please welcome The Perfect Pantry to Rasa Malaysia as Lydia takes us on her travel in Malaysia many years ago, and narrated how she fell in love with mee goreng or spicy fried noodles. Enjoy! By the time we reached the tiny night market, a row of stalls under a tent on the road between Kuantan and Kuala Terengganu, I’d already tasted at least a dozen different versions of mee goreng, the Indian-inspired stir-fried noodle dish of my dreams. We had arrived in Kuala Lumpur a week or so earlier, by train from Singapore. A city of nearly seven million people, KL embodied the juxtapositions that are Malaysia: old and new, Chinese and Indian, traditional and modern, in everything from architecture to industry to fashion and, yes, to food. Our hotel in KL, chosen for its proximity to mass transit, sat atop the central bus station. Despite the chaos below, the hotel was clean and basic, and the budget-friendly room rate included a buffet breakfast. I’m sure there was lots of fruit and cereal, but mostly what I remember was the huge bowl of mee goreng. Noodles for breakfast; from the first bite, I was in heaven. The noodles were a perfect balance of salty, spicy and dry (not in a sauce), tossed with cabbage and potatoes and egg and other things I can’t quite recall. I began to see mee goreng everywhere–not in an hallucinogenic way, but for real, stir-fried to order at pushcarts all over the city. I watched, tasted, and tried to figure out how to make it, but each bowl was different, some more spicy, some without potatoes, some topped with chunks of tomato or shrimp or fried scallions, or not. After a side trip to Melaka, we left KL and crossed to the east coast, where we began our trip north from Kuantan to Kota Bharu, meandering along the shore roads, stopping in small fishing villages, visiting markets and batik factories, taking a boat ride here, buying a sarong there, eating mee goreng at least once a day, and sometimes twice, never exactly the same. And so we came upon the night market, on the beach on a tiny road just south of Kuala Terengganu. From the five or six stalls, we selected the one that made mee goreng. Ted and Cousin Martin sat at a small table, relaxing and watching television, but I’d had enough. I had to learn how to make the noodles that had become my obsession. At the rear of the stall, a small counter separated the sitting area from the “kitchen,” which was a single-burner propane stove and a tiny fridge. Next thing I knew, she grabbed my arm, and pulled me to the rear of the counter. She stuck a spatula into my hand, and with a smile on her face, began to point to ingredients. I realized that she wanted me to cook! Okay, I thought, I can do this. And so we began, teacher and student. She would point to an ingredient, and then to the wok. Put this here, now stir, now add this, yes, add more and so on, until, in what seemed like a nanosecond, I had created my very first mee goreng. I walked out from behind the counter, carrying dishes of fried noodles, to the total amazement of my husband and cousin. It was the best mee goreng anywhere in Malaysia. I’m absolutely sure of it. Later that evening, I tried to write down what I’d learned in the night market kitchen, but I couldn’t quite remember all of the ingredients. And when I got home and began to recreate the dish, I never could get it quite right. Years later, I interviewed chef Alfred Chua, who had opened a small storefront restaurant in Boston’s South End. When I learned he was from Malaysia, I asked him why my mee goreng never tasted the same as the noodles I’d had on my travels. He explained that a lot has to do with heat; our home stove burners simply do not get hot enough to dry out the noodles. Undeterred, I asked him to teach me how to make his family’s version of mee goreng. I’ve played with his basic recipe a bit, and this is as close as I’ve come to the noodles I made in the night market kitchen. Mee goreng or spicy fried noodles is delicious. This easy mee goreng or fried noodles recipe makes a great serving of mee goreng (spicy fried noodles). 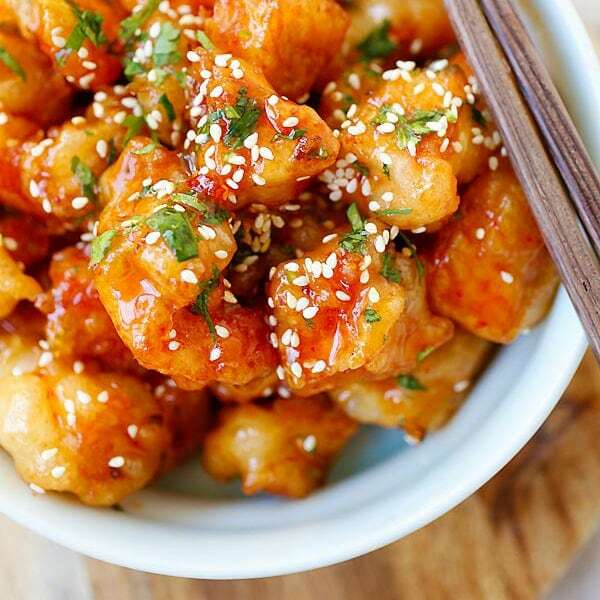 In a small bowl or measuring cup, combine chili sauce, dark soy, sugar, 1/4 tsp salt, oyster sauce and ketchup. Stir to combine, and set aside. In a large wok (at least 12 inches in diameter) preheated over high heat, add the oil. 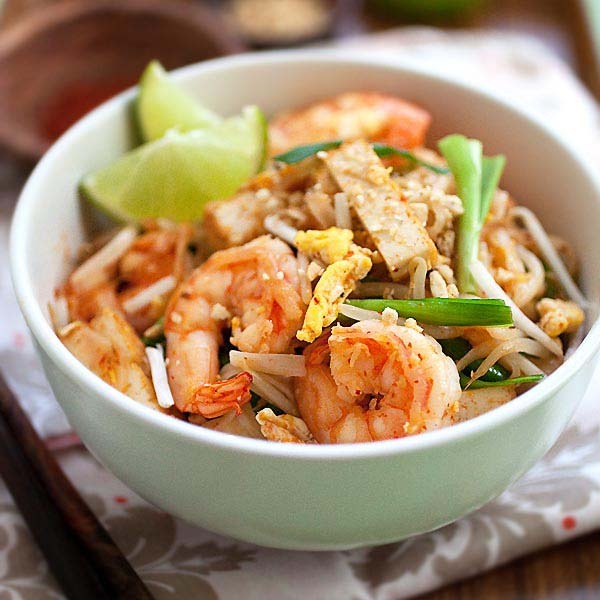 Crack the eggs into the wok, stir vigorously until the eggs are lightly scrambled and just set, then add the garlic, noodles, bean sprouts, cabbage, shrimp, chicken, and 3/4 cup water. 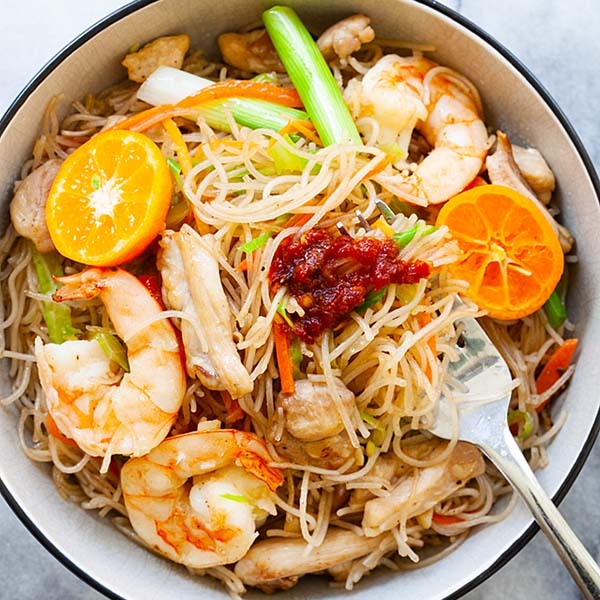 Stir-fry continuously until noodles are cooked, 3-5 minutes (depending on the heat of your wok), making sure to also cook the chicken and shrimp. Add chili sauce mixture, and keep stirring until well combined. The noodles should begin to get a bit drier (no liquid left in the bottom of the wok). Add shao hsing wine and white pepper, stir to combine, and remove from heat. Garnish with scallions and fried shallots. All photos and recipes on Rasa Malaysia are copyright protected. Please do not use the photos and recipes without prior written permission. If you wish to republish this recipe, please rewrite the recipe in your own words instead of copy and paste and link back to http://rasamalaysia.com/mee-goreng-spicy-fried-noodles/. Thank you very much! That’s a gorgeous looking mee goreng. Love the vibrant colors! This is the kind of noodles I love -non-sauced but flavorful! Delicious write-up Lydia! Not to criticize, but as far as I can remember, mee goreng tend to have a darker color, whether it is Malay, Indian or Chinese style. At least those in Kuantan and KL that I’m used to eating. I love mee goreng. The mee goreng in Penang is very good, spicy and have potatoes, squid, and fried fritters. Have you tried the mee goreng in Penang? John P, thank you — the noodles were a bit more reddish in real life. June, I never seemed to have two mee gorengs that were the same, so I can imagine that even within the same family, two people would make it differently. Penang was the last stop on our travels through Malaysia, and I was still eating this dish every day, so perhaps I accidentally found your hawker! Ted, gosh, I’d forgotten all about those stale Pringles…. Veron, I love the dryness of the noodles in this dish, too. Of course I also love gloppy sauced noodles. I love all noodles — but I really think these are my favorite. Jay, most of the mee goreng I tasted did have a darker sauce, and the sauce for this recipe is also quite dark. The noodles were a bit more red than they seem in the photo, but because I don’t put tomatoes into the dish, it’s not as red as some other versions I’ve had. It does have that tomato-chile-soy taste that you would recognize instantly as mee goreng, though. I hope you’ll try it. My Taste Heaven, we did have mee goreng in Penang. I remember one with squid and shrimp that was delicious. What are the fritters? yup, i agree with lydia. no two mee gorengs are the same. my version of mee goreng tastes different to the one my mum prepares. and even then, my mee goreng is never consistent in taste. it probably all comes down to the quantity of seasoning a person uses and also the ingredients…meat/chicken/seafood/etc. i think most of don’t use actual measurements, we normally just eyeball it based on colour and repeated tasting. and yes, high heat is essential for the texture to be drier, which makes it ever so yummy! good job with your fried mee! It sounds delicious. I’d love to go there and eat it myself, but if not, I must have Lydia make this for me sometimes when I visit her again. Great post, great photos, and as an earlier commenter has already said, very fun seeing a non-Malaysian cooking a Malaysian dish. but the population of kl is about 1.8million, unless u in include the rest of the klang valley. And there are Malays in Malaysia, not just Chinese and Indians ;) I’ll still try your recipe though! Looks absolutely delicious! Someday I’d love to go and try some myself. This mee goreng is both my hubby and my’s TOP favourite. Since I had introduced the Penang mee goreng (at Esplanade food court) to my hubby, he got hooked with it. Now he only eats the mee goreng sold at Esplanade food court, Penang. Lydia, you have done it so well! Can’t believe it’s your first attempt! I feel so homesick now. Hehehe! very interesting story! yeah its true that many times our domestic kitchens cant replicate outside food becos we lack the big burners..
the noodle makes me crave for some now.. I agree with June Ong, it’s very interesting to see an American (Lydia) makes a Malaysian mee goreng dish. Great job Lydia. I love your travel story in Malaysia and the mee goreng story. I have always wanted to try cooking behind those propane stoves myself, pretending to be a hawker. Kalyn, I’d love to make this for you! Sureshchong, I looked up the population figures and was also surprised to find that what they consider the KL metropolitan area had grown so much since our visit. Budak, the woman who taught me to make mee goreng was Malay, of course! Donna, I would visit Malaysia again in a heartbeat if I had the opportunity. My husband and I loved everything about our travels there. lk, your comment makes me want to return to Penang and find this hawker stand! Lotsofcravings, until the chef told me, I never realized that it’s the high heat that dries out the noodles and makes them taste so good. Even with my 15,000 BTU burner cranked to high, I can’t replicate the heat of a restaurant kitchen. Still, this recipe is delicious, and I hope you’ll try it. NYMY, I’ll always be grateful to the woman at the night market who was so willing to teach me by letting me do the cooking. Of course if I’d been a better student, I wouldn’t have had to wait so many years until I learned how to make this! my indonesia maid crack d egg in while d noodles half cooked though..must use a gas stove and high heat required! recommend to cook d prawn and chicken separately then add in..
Lydia, you must try the mee sotong (mee goreng with squid) in Esplanade, Penang. It’s the best plate of mee goreng in the world! Your mee goreng looks very yummy too. Good job trying to make Malaysian food. We visited Singapore and Malasia last month, we tried many recipies but roti jala and chicken curry we liked most ,thanks for your recipe I shall try this definitely. Your mee goreng looks great!! Gee, that looks sooo good! I’m a sucker for Chinese noodles! We bumped into your blog and we really liked it – great recipes YUM!!! YUM!!!. This is one of my favorite (if not the #1!) Malaysian dishes…the type I could (and will!) eat over and over when I finally do visit Malaysia (so far I have only had it in restaurants here which I’m sure are not as good!) :) Lovely guest post! Love the story of making the mee goreng in the stall! Claude – I thought you have forgotten about my blog :) Thanks always for your compliments. hi! they do look great and i bet they taste great too!! Made this and YUM, YUM, YUM, YUM, YUM!!!! Can lo mein noodles be substituted for the egg noodles? I think you should try Mee Goreng @ Bangkok Lane, Penang. Haha, they also included in this video I saw yesterday. Just tried this recipe. Very good. 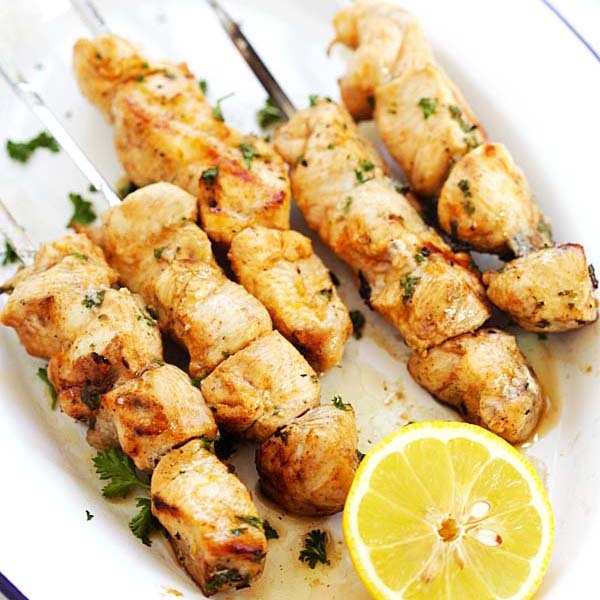 I added a bit of lemon juice and sesame oil to lighten up the flavors, it worked really nicely. This story reminds me of my stay in KL back in 1993/94. We had a rented condo in KL Plaza and ate most nights on the hawker stalls. I fell in love with the food there, but particularly the mee goreng, nasi goreng and my almost daily breakfast, roti canai. This paratha like bread served with a cocoanut gravy was so simple but tasty and cheap with my teh terik each day. I was curious to find out how it was made, so one day I approached a hawker in the food court in BB Plaza to ask if he would show me how to make it. Like your story, he didn’t speak English and I didn’t speak Malay, but we sure had a great time making roti canai. He found it quite comical that an ex-pat would want to learn something like that. As it turned out, there were only about 4 or 5 ingredients and super simple, but the swinging part is an acquired skill. Roti canai I believe is translated as “swung bread” which refers to the skill of tossing the roti overhead to get it large enough to layer in the ghee (clarified butter) and repeatedly refold it to get the fluffy consistency of a cross between a croissant and a flat-bread. It is a fond memory of my stay in KL. This is one of my husband’s favorite dishes from his time living in Singapore so I tried your recipe. The major missing component was tomato (the ketchup was not enough). I added an entire large can of Muir Glen peeled whole roasted tomatoes, cut in chunks, including the liquid. I also felt the proportions were off of noodles to other ingredients. I think that’s because the 2 cups of noodles cook to a much larger volume. I added chunks of pork tenderloin, more large shrimp, and next time I will add more cabbage and bean sprouts, etc. Got it at New May Wah in San Francisco. My sister is cooking this for us tonight! If we are to talk about authentic mee goreng then i think that it originates from somewhere North of Malaysia which is probably mamak-influenced. The original mamak version had boiled potatoes, tomatoes and tofu all thrown into the hot wok with chilli paste, soy sauce and ketchup. Ask your parents and see if they can recall such a dish. My all time fave mee goreng was from the 90s on Jalan Riong, next to the NST office. The Indian guy there used to fry his cili boh while waiting for customers; i think that was the reason for his really delicious noodles. I could eat two plates of of his for lunch sometimes. Pity he’s no longer there. I just made this for dinner today. I used different veggies, whatever was in the freezer, but I made exactly the same sauce, and it was really yummy :-). Thanks for the recipe. You have a wonderful site! we used to enjoy mee goreng all over Malaysia and as you say it came in different ways, often only common elements were egg noodles, egg and a wok. The Indian influenced mamak style with curry spices, potato, tomato and topped with shredded lettuce was a favourite. These typically also included sliced chicken, prawns and tofu puffs. Some key differences to the recipe above were no shaoxing wine or added sugar and using ketchup manis rather than dark soy (this may be the missing flavour your are seeking) and fresh tomato. As some others commented the egg was added towards the end of the cooking.